The Dead Sea region constitutes a unique environmental system on Earth. Set in an extraordinary landscape and cultural area, it is central to life in this region and of great economic and ecological importance. Today, the region is faced with rapid environmental changes and a multitude of hazardous natural phenomena. 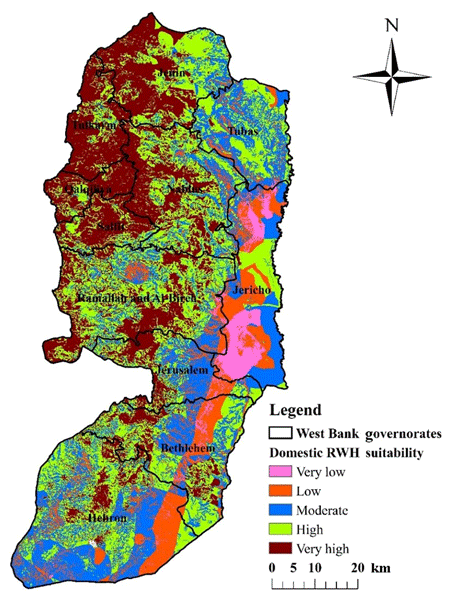 The ongoing lake level decline of the Dead Sea, the desertification process, occasional flash floods, the development of numerous sinkholes, and the existing significant seismic risk indicate that the region can by affected by important human, economic, and ecologic loss in future. Due to its outstanding characteristics, such as sharp climatic gradients, extreme water salinity, its dynamics, and the combination of both natural and anthropogenic drivers, the Dead Sea region represents a unique natural laboratory in which to study multiple disciplines such as geophysics, hydrology, and meteorology. The environmental changes in Earth, atmosphere, and water are linked to the main geomorphic feature in the region, the Dead Sea Transform fault system. Due to this active fault zone, the region is exposed to severe earthquake hazard, which in turn, considering the exposed assets and the vulnerability of the building stock, determines a significant seismic risk in the region. Knowledge about processes and structures in the underground is also required for the study of sinkholes. Sinkholes form when groundwater, undersaturated with respect to easily soluble minerals, uses faults as conduits to percolate to subsurface salt deposits. The water dissolves and flushes the salt, leading to a collapse of the underground substrate structure. Thus, the development of sinkholes is enabled. Besides triggering sinkhole formation, groundwater recharge determines the available water resources. The Dead Sea being a terminal lake, its water level decline is controlled by changes in subsurface as well as surface water inflow and evaporation. A direct link to hydrology and atmospheric sciences is thereby established. The rapid shrinking of the water surface area is accompanied by a strong local climatic change, which induces changes in atmospheric circulation patterns. Here, the Dead Sea can be viewed as a laboratory for studying effects of climate change under much accelerated conditions compared to the rest of the world. 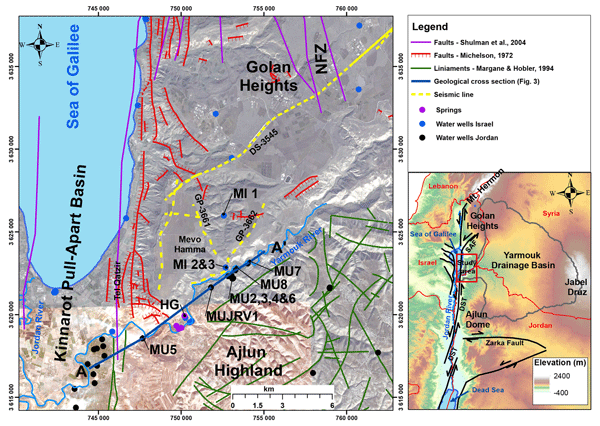 The objective of the multidisciplinary special issue “Environmental changes and hazards in the Dead Sea region” is to compile research and recent advances on the atmospheric, hydrological, and geophysical processes and dynamics of the Dead Sea and its surroundings, which are also of prototype relevance for other (semi )arid terminal basins of the world. Papers included in this special issue could address the processes of sinkhole genesis, groundwater recharge and movement, flash flooding, as well as seismic or severe meteorological events and could include topics such as the quantification of the water budget components. Moreover, contributions are invited that demonstrate how this knowledge contributes to aspects of risk assessment (or its main components like hazard, exposure, and vulnerability) and could assist in efficient risk mitigation and remediation strategies as well as to appropriate implementation of early warning systems in the region. Both measurement and modelling studies are welcome. The planned special issue aims to address the unique conditions of the Dead Sea region from different disciplinary views. Given the fast environmental changes in the different spheres, the special issue will be of wide interest to readers from seismologists, geophysicists, engineers, and hydrologists to meteorologists. Interest will not be limited to researchers working in the region as similar changes are occurring in other parts of the world too, many on a much longer timescale. The special issue is initiated by the Helmholtz Virtual Institute’s DEad SEa Research VEnue (DESERVE). The project brings together researchers working on diverse research fields related to the Dead Sea environment. The special issue will be open for all submissions within its scope. 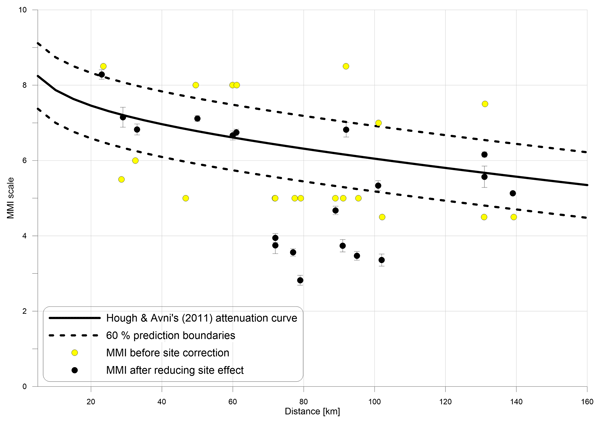 Submarine groundwater discharge is highly variable in spatial and temporal terms. With a novel approach using a hovering drone over a predefined location which recorded 670 surface temperatures images over a period of 167 s, we are able to (i) enhance focused SGD patterns otherwise camouflaged by strong lateral flow dynamics, (ii) show size variation of up to 155 % (focused SGD) and 600 % (diffuse SGD), and (iii) reveal short-term periodicity of the order of 20 to 78 s for diffuse SGD. Sinkholes are round depression features in the ground that can cause high economic and life loss. On the Dead Sea shoreline, hundreds of sinkholes form each year driven by the fall of the water level and subsequent out-washing and dissolution of loose sediments. 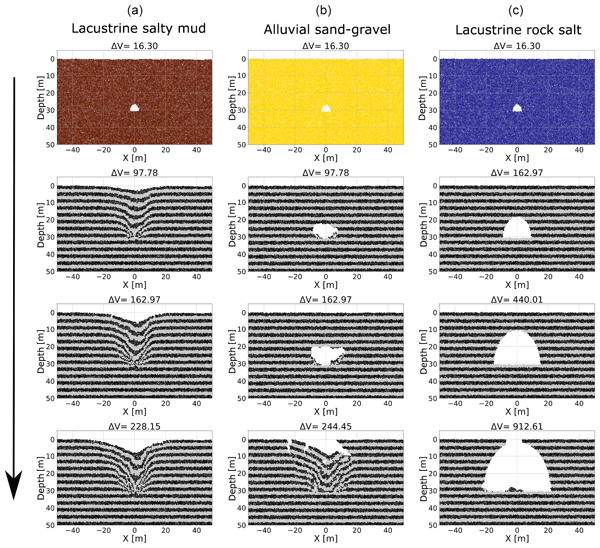 This study investigates the mechanical formation of sinkholes by numerical modelling. It highlights the role of material strength in the formation of dangerous collapse sinkholes and compares it to findings from a field site in Jordan. The Dead Sea shore is a dynamic karst system. It started developing in the 1960s, when its water resources were diverted. The Dead Sea water level is lowering (at approximately 1.4 m/yr in 2018), causing disequilibrium between the underground fresh waters and the base level. Remote sensing techniques combined with repeated field observations provide an early warning system against resulting hydrogeological hazards, limiting or preventing possible disastrous consequences related to subsidence. The alluvial fan of Ghor Al-Haditha (Dead Sea) is affected by subsidence and sinkholes. Different models and hypothetical processes have been suggested in the past; high-resolution shear wave reflection surveys carried out in 2013 and 2014 showed the absence of evidence for a massive shallow salt layer as formerly suggested. Thus, a new process interpretation is proposed based on both the dissolution and physical erosion of Dead Sea mud layers. The extraordinarily extreme dust storm of September 2015 is analyzed using an array of eight ceilometers and auxiliary measurements, revealing the dust plume penetration, ground coverage and gradual dispersion in the first kilometer above Israel. 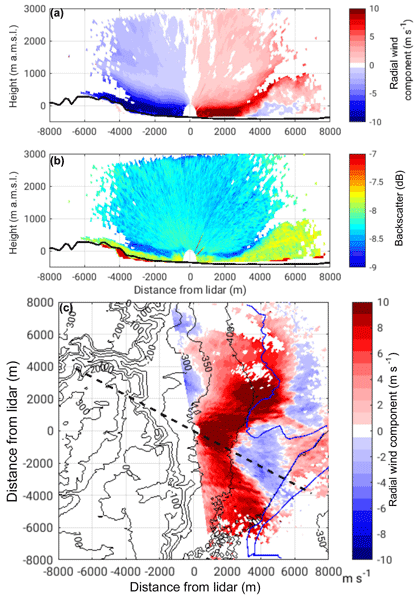 This research emphasized the importance of ceilometer networks as an essential tool in the analysis of meteorological phenomena and aerosol transport as being the most valuable in the mesoscale. 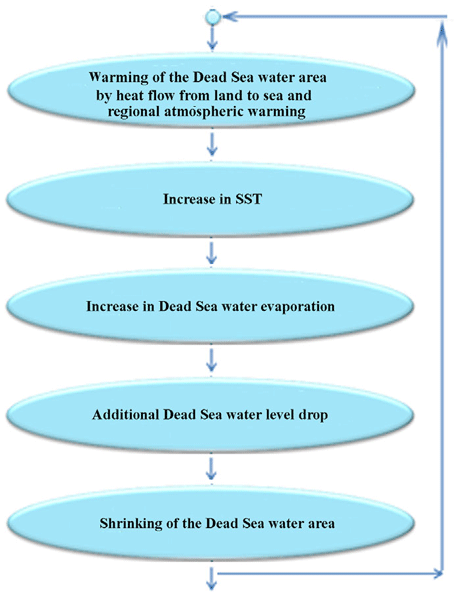 This paper is motivated by the need for more precise evaporation rates from the Dead Sea (DS) and methods to estimate and forecast evaporation. A new approach to measure lake evaporation with a station located at the shoreline, also transferable to other lakes, is introduced. The first directly measured DS evaporation rates are presented as well as applicable methods for evaporation calculation. These results enable us to further close the DS water budget and to facilitate the water management. Spatiotemporal rainfall patterns in arid environments are not well-known. We derived properties of convective rain cells over the arid Dead Sea region from a long-term radar archive. We found differences in cell properties between synoptic systems and between flash-flood and non-flash-flood events. Large flash floods are associated with slow rain cells, directed downstream with the main catchment axis. Results from this work can be used for hydrological models and stochastic storm simulations.